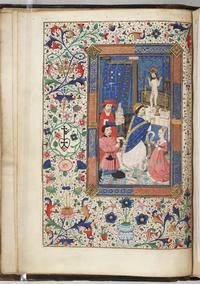 The first part of the story of the Browne Hours was posted on Thursday, October 24th. For the first part, read here. Thomas Becket, the Archbishop of Canterbury, was killed by four knights while he prayed at the altar in Canterbury Cathedral on December 29, 1170, supposedly on the king’s orders. For a simple explanation of the situation, he had been arguing with the king, Henry II, over the powers of church and state. Becket was quickly canonized by Pope Alexander III in 1173 and his remains were removed to a phenomenally ornate tomb at Canterbury Cathedral on July 7, 1220. Two feast days were observed in England for St. Thomas Becket: December 29, the date of his death; and July 7, the date of the translation of his remains. The tomb of St. Thomas Becket was visited by pilgrims from all over Europe, and it was the destination for the pilgrims in Geoffrey Chaucer’s Canterbury Tales, which was written in English at the end of the fourteenth century, around 200 years after Becket’s death. 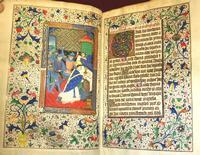 Turning to the suffrages of our book Widener 3, or the Browne Hours, we have a full-page miniature of St. Thomas Becket. By royal injunction of November 1538, King Henry VIII of England decreed that images of St. Thomas were to be destroyed. As can be seen in this photograph of the Free Library’s book, the owners at the time couldn’t quite bring themselves to destroy the Becket image. However, they did mark out the text on the opposite page with a graphite pencil. Interestingly, it turns out the Browne family, who lived in Stamford, Lincolnshire, attended the All Saints Church in Market Street, and they were all buried in the St. Thomas of Canterbury chapel there—so the family had a strong feeling toward St. Thomas in particular. King Henry VIII also wished for the feast days of St. Thomas to be scratched out in the calendars of all books, and both feast days are intact in the calendar for the Browne Hours. But Henry VIII also decreed that images of the Pope and his trappings should also be scratched out of books. As can be seen in this image of the Mass of St. Gregory, the triple crown or papal tiara of the Pope has been scratched out, showing that the book’s owners in 1538 did comply with this order. This miniature is also interesting because it depicts the original owners of the book, John Browne and his wife Agnes, painted into the picture. Browne also had his merchant's trademark—a heart-shaped base with a small "B" supporting a cross-staff with two chevrons—included in the border decoration to the left of his portrait. 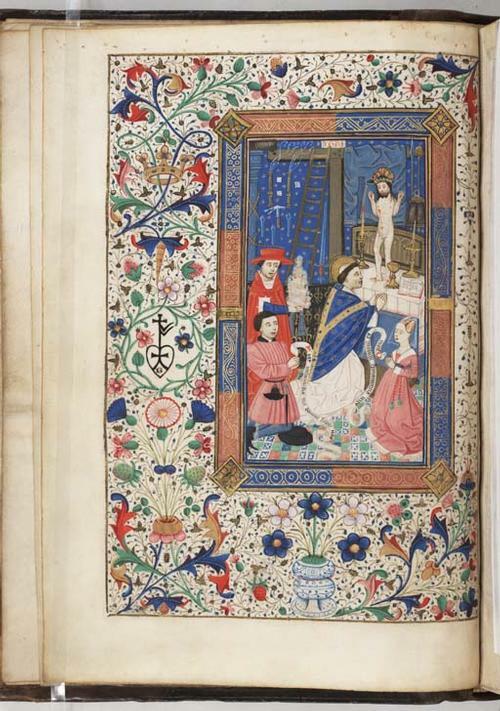 For more on the Browne Hours, visit our database. 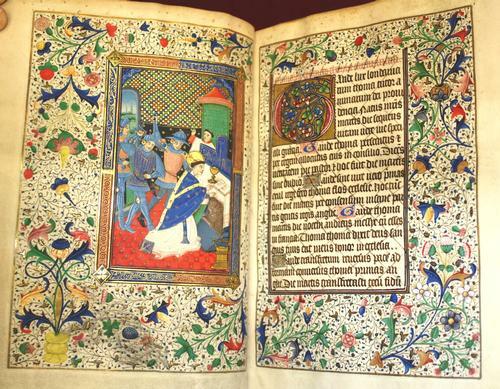 For information about Thomas Becket, or Henry VIII, check out our online catalog.